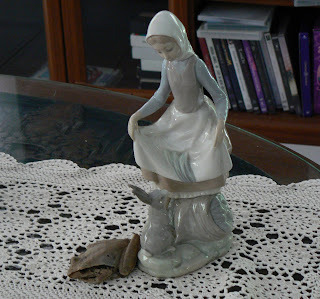 Daintree Valley Haven: "Rocket 'n Rabbit"
A new ornament on the coffee table - the Tawny Rocket-Frog who normally lives in the wine-rack(!) seems to have needed a little company and has spent the past two days cuddled up next to the rabbit and the lady! This is beautiful to have Rocket frogs coming into the house and posing as ornaments! We have three small ponds around the house and that is where they are hiding.